EPIC! 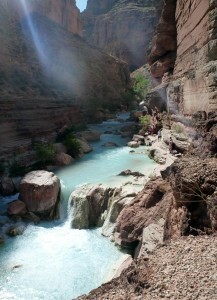 I Wanted to Stay and Finish With the 3 Day Grand Canyon Rafting Trip! I booked this mid-June Grand Canyon rafting trip almost a year in advance as part of my 40th celebration and sent the call out to family and friends to join me. 10 of them answered the call - from teenagers to mid-70s. It was a phenomenal trip. By the end, everyone on those rafts was now part of my family through the shared wonder of the Grand Canyon. Everything you read about the guides on all the reviews is true - and it doesn't even begin to do them justice. Trust me, you'll love every single one of them for their love for the canyon, and their dedication to making the trip the most amazing experience you can imagine. #1 Do get the trip insurance. Life is pretty remote in the Grand Canyon, and you don't want to worry about a thing. I didn't and every time I stubbed my toe I freaked out a little bit. This is the Wild West - so be prepared. #2 If you are cold natured at all, neoprene socks will be your friend. I wish I had some, and it hit 110 several days on our trip. That river is CHILLY. #3 Bring more cash than just the 10% recommended gratuity. You don't have to use it, but if you have half the experience I did, you'll be glad to share it. The guides truly are amazing and I didn't have near enough money to begin to thank them for hand walking my 70-year-old+ mom to and from Havasu Creek - it was the highlight of the trip for her, and while I would have helped her, I didn't have a chance because they were already there. At least 1, but often 2 guides were holding her hand and helping her up and down the tricky parts.